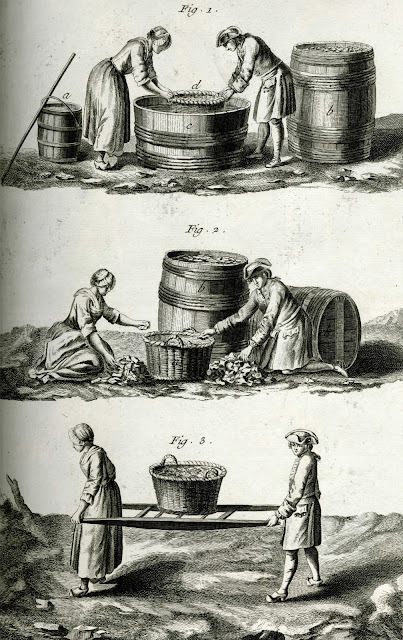 After a while, when the glass is well fused, take it out of the crucibles and throw it into large earthenware pans or clean sturdy wooden tubs filled with fresh water. This step of throwing the glass into water has the effect of causing the water to remove a kind of salt called Alkali salt [glass gall], which ruins the cristallo and makes it dark and cloudy. So while it is still being worked let the glass spit out this salt, a substance quite foul, then return it to clean crucibles. Carry out this flinging into water repeatedly as necessary. In order to separate the cristallo from all its [alkali] salt, this should be repeated to the satisfaction of the furnace conciatore [glassmaker]. If you throw it into water at least one time, what you will have will be beautiful and clear. The same is true for common glass, which once brought to perfection you should return to the crucibles for use. It will be bright, fine and quite satisfactory to work in those jobs that require it. […] when a more than ordinary fine glass is desired it is necessary. Beyond becoming very white[clear], it calcines and clarifies nicely with few impurities. This technique becomes even more critical for Neri's lead crystal, in fact, any glassmaker who ignored this step for a leaded glass did so at risk of a major disaster. In a few hours everything will have clarified, now purify it by throwing it in water. Inspect the glass carefully before returning it to the crucible. All lead precipitating out of the glass must be removed with diligence, throwing it away, so that it does not make the bottom of the crucible break out, as can happen. Return the glass that was thrown in water to the crucible and leave it to clarify for a day. In addition to washing the glass, sometimes the top layer of a melt was skimmed off and discarded because it contained contaminants that floated to the surface. To complicate matters further, molten glass can stratify in the crucible, meaning the composition might vary from top to bottom and from the center of the pot to the edges. Scientists and historians have collaborated to see what can be learned from period samples of glass. When attention is focused on the composition of a single type of glass, like Venetian style cristallo for example, one might expect a wide variation. The opposite turns out to be true. Even with all of these factors conspiring to change the glass composition, remarkably the analysis shows it is quite difficult to tell apart glass that was known to be made in Florence from that of Antwerp or Venice. Recent efforts have centered on identifying minuscule amounts of trace materials in the old glass that were unique to the raw ingredients of a specific region. 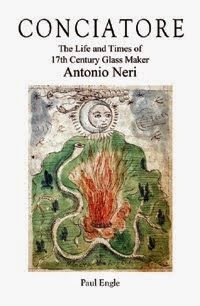 Meanwhile, Antonio Neri's glass continues to elude us, even though it might be sitting on the shelves of museums around the world, right in front of our eyes. * This post first appeared here on 9 May 2014.